Not every log cabin is rustic. 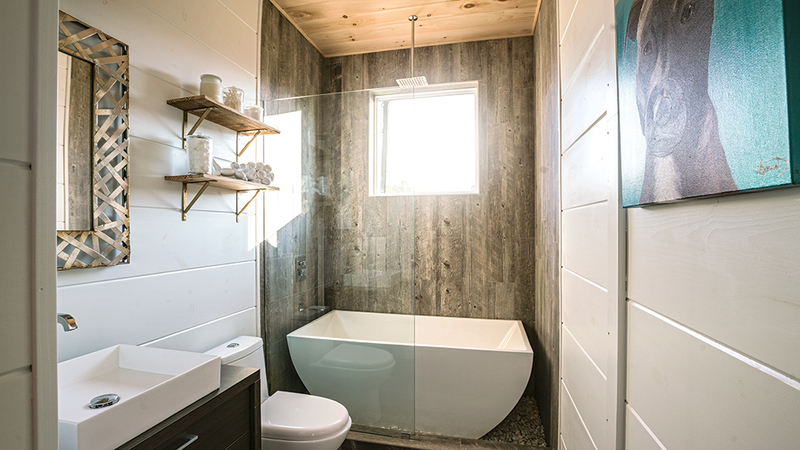 In a modern twist on traditional cabin design, this modular log home boasts a distinctively West Coast vibe. From design to decor, with most log homes you know what you’re going to get before you walk through the front door. But sometimes, there’s a surprise in store. 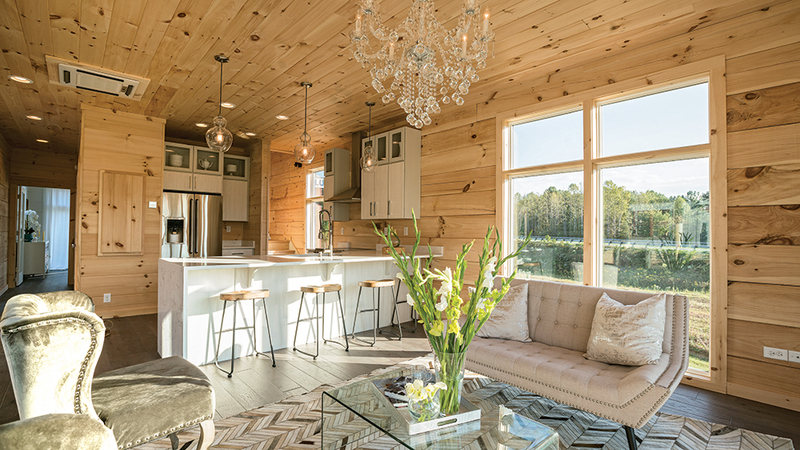 Luxe Log Homes, a new series of modular open-concept retreats from Blue Ridge Log Cabins, offers a contemporary option that breaks the “antler chandelier” mold. In response to market research and inspired by a distinctly West Coast vibe, with clean lines and a generous entertaining space, chief designer Sarah Davis has dreamt up a dwelling that offers many log home lovers what they have been seeking for a while: something different. The typical pitched roof has been flattened, floor-to-ceiling windows abound and the minimalist design complements the natural world outside instead of trying to imitate it. The cabins are equipped with high-tech amenities, such as independently controlled thermostats in each room (the HVAC is integrated into the ceiling) and Bluetooth-connected light bulbs that double as speakers. 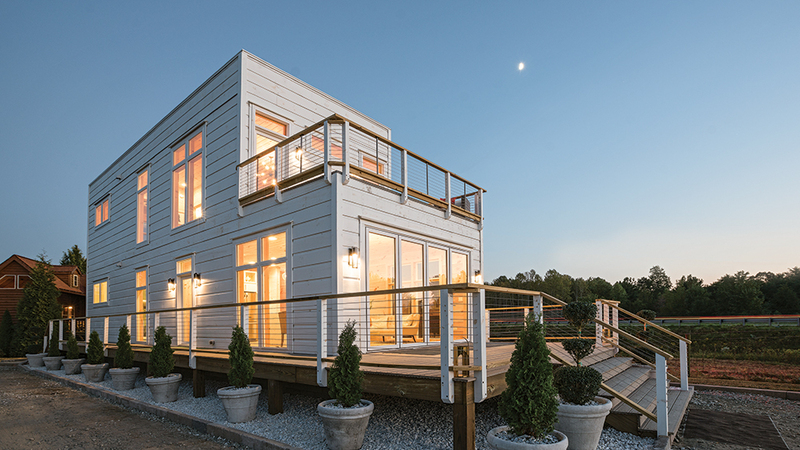 Because of Blue Ridge’s customizable modular approach to log home construction, Sarah describes the Luxe line as “Legos for adults.” Luxe Log Homes can be constructed as easily in Bermuda as they would be in Boston. 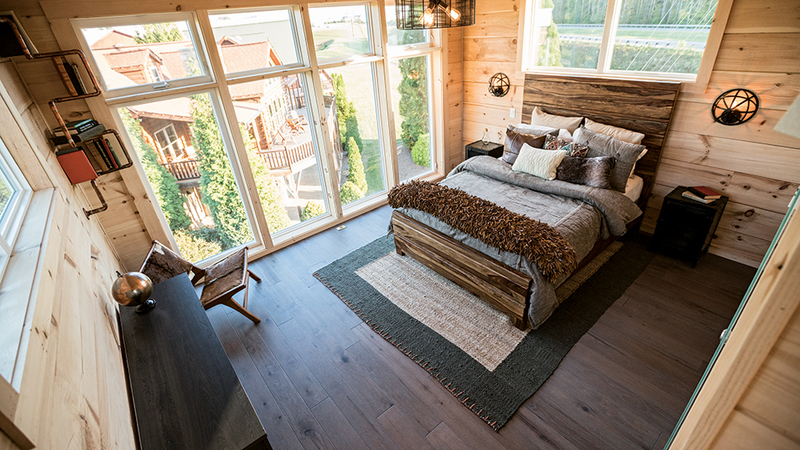 Produced in the same factory-controlled environment as their traditional log homes and mountain architecture series, Blue Ridge Log Cabins displays the breadth of their brand with this modern reimagining of the rustic hideout we’ve always enjoyed. Visit Luxe Log Home’s website for more information: luxelog homes.com. See also What is a Hybrid Cabin? 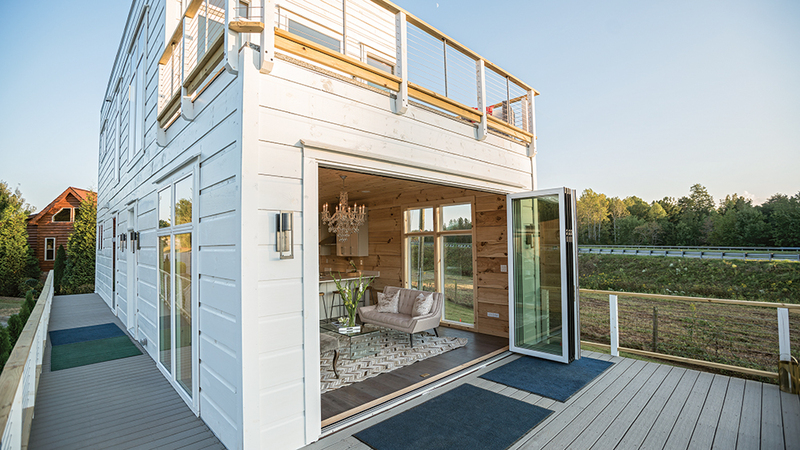 This cabin by South Carolina-based Blue Ridge Log Cabins, is a versatile design featuring two bedrooms, two baths, a great room, flex space and a second-level balcony all within 1,417 luxurious square feet. A retractable window wall makes for true open-concept living, blurring the line between the main living area and the expansive outdoor deck. 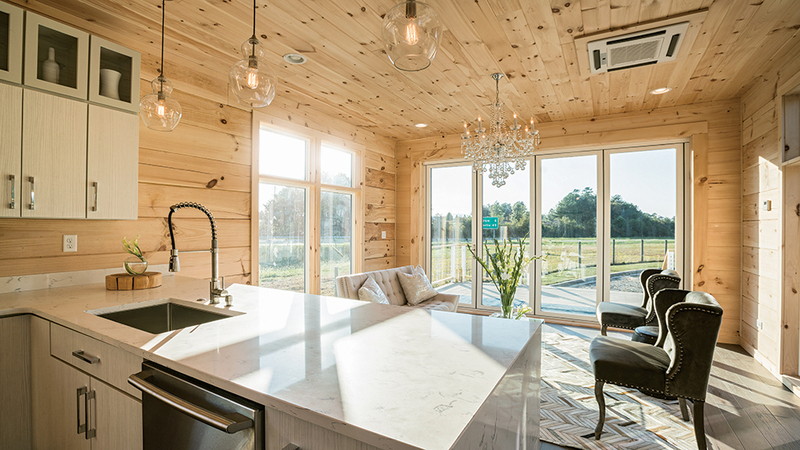 A whitewash on the floor, clear coat on the walls and floor-to-ceiling windows make the small cabin feel bright and airy. Unexpected details, like crystal chandeliers, keep the minimalist space from feeling austere. With the rustic wood elements of a more traditional log home in plain sight, this cabin is streamlined and utterly modern in its approach. Each bedroom is roughly 15-by-12.5 square feet — quite spacious for a home of this size — but they live even larger. Sleek finishes and crisp lines define the bathroom. Note the very “of-the-moment” trend of placing the tub inside the shower. 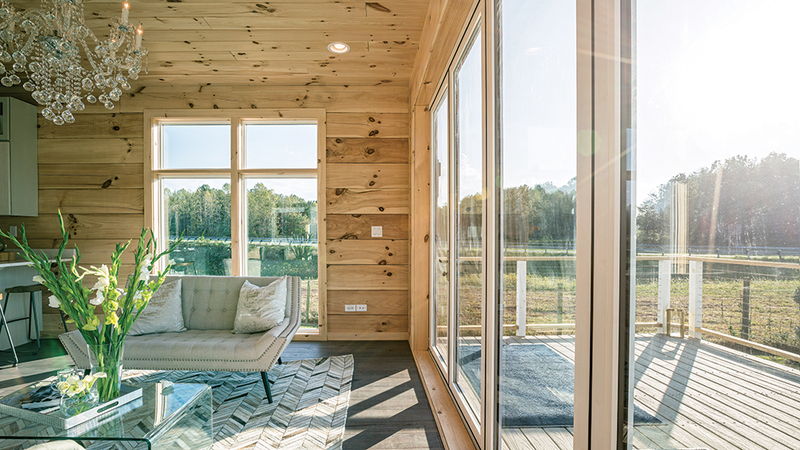 There are window walls at every turn, allowing the cabin’s homesite to pull double duty as artwork.